2. Auto texturing and material parameter parsing. Download the latest version of Noesis. As explained on the previous page, each mesh file has it's own corresponding .mdf.10 file that holds material information. It must be renamed exactly the same as the mesh file minus the file extension. Check the debug log window for more details. I can not seem to see the mesh/models in Noesis to choose from. I can see the textures tex.10 and tex.dds only with Gh0stBlade script. What am I doing wrong? spazman wrote: I can not seem to see the mesh/models in Noesis to choose from. I can see the textures tex.10 and tex.dds only with Gh0stBlade script. What am I doing wrong? did you select in "files type" "all know formats"? Is there a way to merge mesh files on Noesis on import, like body then add head/hair mesh into the preview window. yes, I do not see anything else but texture files. 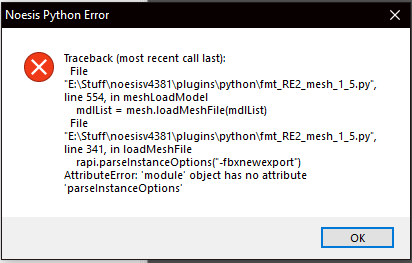 The mesh are in the folder but Noesis and Gh0stBlade's script does not seem to see it. Second: be sure to update your Noesis to the last version. If you want the model with textures, you have to rename the mat file exactly like the mesh file. Keeping the extension. Sorry but I tried that. The python script only gives me texture files and not the mesh. I also check the "check for updates" and it says I am already using the latest version of Noesis. I see the mesh are in the folder but Noesis can not detect them. I did use an expanded list on quickbms. Is that the problem? What list did you guys use for quickbms? Meshes probably have the wrong file extension. The script expects .1808312334 for the mesh's file extension. If you unpacked the game properly using the bms script with filenames it should work. I do see the mesh.1808312334 in the folder but the script does not detect it for some reason. What bms script with filenames did you guys use? I used an updated one but it may be the wrong one. found my way here from the Resident Evil Modding Boards. (Much thanks to Luigi too for showing the the links to get to this thread). I'm a hobbyist animator, and a rigger by profession. I only have a decent rudimentary amount of knowledge in maxscript, python and mel, and I am by no means a scripter / coder. I am here because I find the concept of being able to import our own custom models back into the game very enticing. Much of what I've seen of the successful (Character swap)mods so far are done by replacing and renaming certain .pfb files and placing them in the appropriate directories. You guys probably already know that. My question is - is there already a tool around that allows importing standard DCC formats (such as .fbx) back into the game? I mean I understand, that if we want a rigged character with the proper skinning, on the rigging side I will need to prepare a skeletal structure that conforms to whatever is being used in the game. But before I proceed to do that, I'd im curious to know if it's already possible at this point in time. I've seen a few early posts in this thread talking about meshes working properly with the correct weights and whatnot ~ but I'm assuming that those were referring to character models that were successfully exported out and not into the game. Thank you for taking the time to read this. I promise I wont be a bother. after some reading back and forth on the first 3 pages of this this thread, I managed to successfully test importing some skinned meshes into max. there are quite a number of .mes files located just outside the natives folder after doing the unpacking with quickbms. Ive been importing .mes files randomly and so far ive found a dog (https://imgur.com/a/47NOmbw)that i dont believe ive seen in the game, a zombie head and what looks like a long chain of sewer poo poo. 1 Which .mes file should i look at if im interested in the characters? 2 how do i look at these meshes with their tectures? as for the textures, i guess we have to manually re-assign them to new shaders on our own yes?